Hello! It’s Robyn Wood with you today sharing a glittery Christmas card featuring Helmar adhesive. Did you know that you don’t need a special glue to stick fine glitter? Helmar Tacky Craft Glue does the trick, it dries perfectly clear and the glitter stays where you put it. With a few weeks until Christmas, I thought you might have a bit of time to create a few more involved cards in time. This one uses up a few scraps so double win. The card base is created from the strip left over when you cut a pair of A5 cards from a full 12” x 12” sheet. That bit that isn’t quite wide enough for a proper card can be used as a base for a skinny, tent folded card. The final card ends up the usual A6 size so fits perfectly in an envelope. I started with a piece of red card measuring 9.5cm x 30cm but you can go thinner if necessary. Cut a front panel to measure approx. 9.5cm x 14cm and stamp with trees using different shades of green Distress Oxide inks. I love these inks for their lovely opaque chalkiness but any coloured inks will do. Refer to my image for placement of the trees, it will look best if you allow a bit of clear space on the left-hand side. Tear the bottom of the panel then layer with a contrasting coloured panel measuring approx. 10cm x 14cm. Tie the bottom with red ribbon. Ink the greeting stamp using Versamark ink and then with Fired Brick Distress Oxide ink and stamp onto a scrap of white card. Sprinkle with clear embossing powder and heat set to give a raised, embossed effect. Inking with Versamark first means that you can emboss the quick drying Distress ink. Trim closely and mat with a contrasting colour before adding to the top, left hand corner of the card panel using Helmar Tacky Craft Glue. Create the reindeer by covering a piece of cardstock with music paper using Helmar Tacky Craft Glue. Make sure the glue is totally dry, then die cut with a reindeer die. 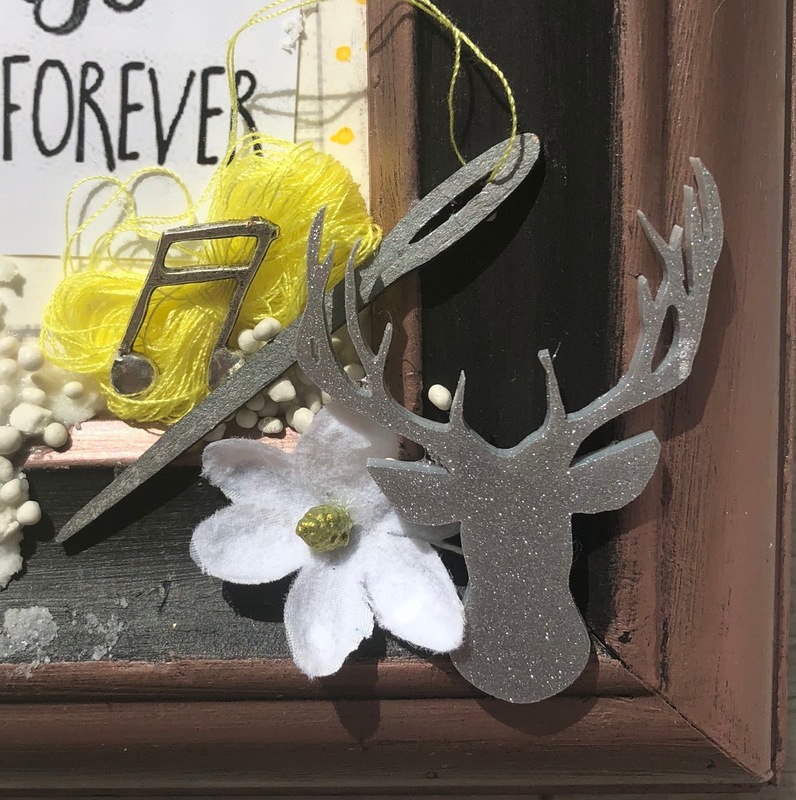 Spread a little Helmar Tacky Craft Glue over the antlers and back of reindeer and sprinkle with fine glitter. Set aside to dry. Using Helmar Tacky Craft Glue, assemble card by layering panel over card base so that the overall width is approx. 10.5cm. Attach reindeer so that it is standing just in front of the trees. To finish the card, add a tiny red gemstone using Helmar 450 Quick Dry Adhesive – after all, a reindeer needs a red nose! Good day, good people, Tamiko here with a shadow box project just in time for any occasion. I like reminders of good affirmations and decided this was a perfect way to display some just using somethings I had around the house. Seen below is a chart I used to create my shadow boxes. I am working on the courage to start recording in the near future. If you have any questions please feel free to leave me a message in the comments or just search shadow box tutorials on youtube. What I basically did is I chose to use a double sided sheet of decorative paper. Scored each side on the 1/2 inch four times from each edge of the page. The written directions get a little complicated from here! In the corners you have created 16 small boxes and on sides 1 and 3, which are opposite each other, you want to cut from the edge to the fourth score line. There are for lines like this, for sides 1 and 3. before you cut sides 2 and 4 you need to add a second set of score lines. The four score lines in each corner need to have yet one more 1 inch scored line. The reason for this is because as we fold on the lines and go around the sheet of card stock, some sides need to overlap with out the bulkiness factor. So on sides 2 and 4 at the 2.5 inch mark. you need to score up to one inch (that's the second score line on the page). This needs to be on all 4 corners on sides 2 and 4. go back and cut these lines with your scissors. Also on sides 2 and 4 you want to extend that last cut and go diagonally to the next score line. Repeat this on all four corners of the 2 and 4 sides. and the last cut just goes forward to the center box ending at the 2 inch mark/4th score line. The corner should fall out here. Repeat this step on each corner of sides 2 and 4. Once all 4 corners have fallen. In this project I made two different size boxes., the directions given were based on creating the larger box, from a 12x12 piece of paper. Decide which side of the paper you would like to use as the inside of the shadow box. Keep that side up, then barnish each scored line with a valley fold. Place Helmar's Super- Tac Eva glue on the outer most flap of the fold section and flip it inward creating a squared flat raised edge. Repeat to opposite side. Place Helmar's Super- Tac Eva glue on the outer most flap of the fold section and flip it inward creating a squared flat raised edge. Repeat to opposite side. These sides are shorter and you will see why you did the fancy extra cutting to those corners. I also connected the boxes after creating a bow with long tails. I used the tails to connect the boxes like a wall hanging again using that wonderful Super Tac Glue! Finally, I very simply embellished the shadow boxes. I had sunflowers I bought from Michaels. I cut of the blooms from the stem and collected the leaves for future projects. I saturated the bottom with Super Tac Glue and placed it in the smaller box. I fit my quote to size added some Super Tac Eva and plopped it in the center of the larger box! Voila! 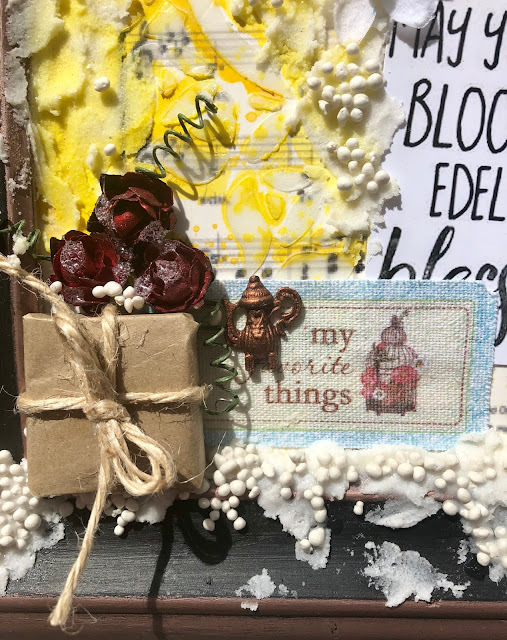 Instant shadowbox with a message of gratitude! I hope this process wasn't too confusing for anyone and I really hope if you have questions you will reach out and let me know! Gratitude unlocks the fullness of life! Thoroughly enjoy the longevity of ALL your artsy creations by including HELMAR in those projects!! Hello! 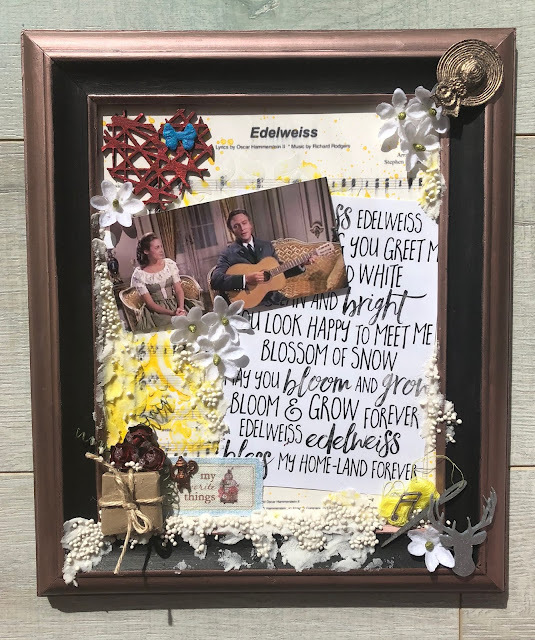 It’s Robyn Wood with you today sharing an easel card featuring Helmar adhesive. I love making folded cards but sticking all the layers down can become quite time consuming, liquid Helmar adhesives make it so quick and easy. I decided to make a card for a friend who is travelling overseas for the holiday season, our shared passion and the reason we became friends is photography. She is heading off on an amazing photography trip through parts of Europe so I thought the imagery and sentiment suited perfectly. Easel cards look much harder than then are but once you know the secret they become very easy. The base is the same size as a normal card base, either rectangular or square, the piece that is usually the front is folded in half instead to give a flap for the card front to be glued to. I started with a card base 15cm x 30cm and scored it at 15cm and 22.5cm with mountain folds. The fold at 15cm stays as the spine of the card and the one at 22.5cm becomes the hinge for the flap that folds up to look like an easel. Start by assembling the pieces to decorate the card. There are two panels to decorate - the layer that becomes the card front and the piece that holds up the easel. Following my dimensions, the front panel will be 14.5cm x 14.5cm and the second panel will be arranged over a piece of pattered paper 5cm x 15cm. Once the embellishments and paper pieces were selected and trimmed, each piece was sponged with brown ink to give an extra layer of dimension. I used a fine black pen to add a line of faux stitching to the front panel of craft cardstock. Then I started to layer the pieces to the panels using Helmar Tacky Craft Glue. 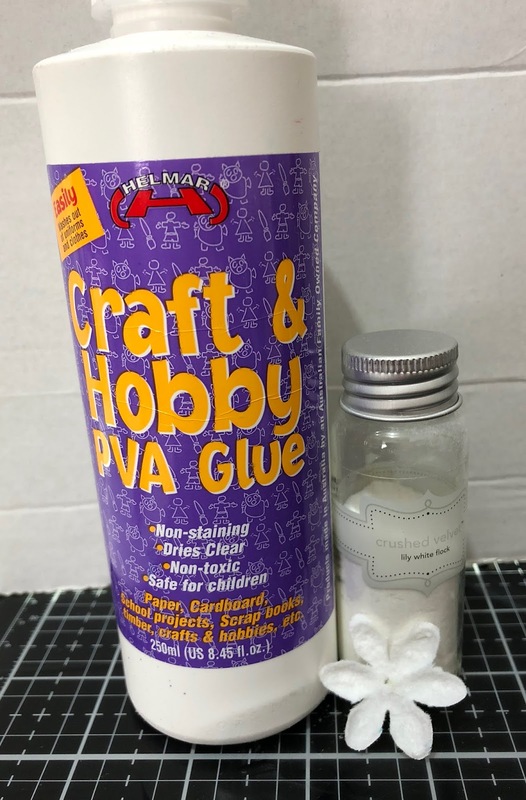 This glue makes it so easy to affix pieces that have fussy cutting, a little dab of Helmar Tacky Craft Glue and nothing will lift! The narrower panel needs some pieces that have a little dimension, so the front panel can ‘prop’ up. Helmar Scrap Dots are the perfect adhesive to use for a touch of extra dimension, a few dabs on the appropriate pieces is all you need. The layered square panel is affixed to the flap so that it can stand up and the layered rectangular panel is affixed just inside the card as shown. 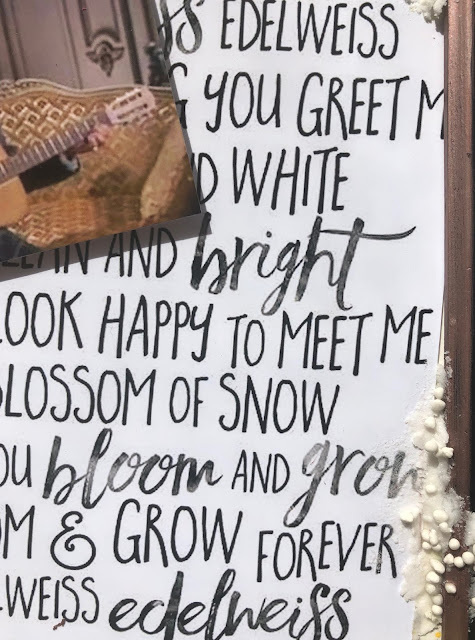 To finish the card, I added a grunged up metal quote using Helmar 450 Quick Dry Adhesive. I first painted it with a coat of gesso and just before it dried, I rubbed the metal back a little with a paper towel. A touch of dark grey permanent ink and a few scratches gave it the look I was after. Hello Helmar fans, Raelene with you today sharing my Music layout that I created to document a special photo of my eldest at her first band camp. I started by getting out 3 photos I wanted to scrap - this one, a photo of my son at playing his sax with the school band at assembly for the first time and a group selfie from when my daughter toured as a cellist with Elvis to the Max when she was 19. I then got out the last of my music themed kit from Scrapping Fun Kits last year and some left over bits from creating my Happy Days Diner layouts in September and set to work. Once I had this all out I looked at the photos and decided the Band Camp photo was the one most suited to my supplies and started creating. As my daughter loves purple I decided to paint the chipboard piece with my Dina Wakley paint in eggplant and then give it a coat of some gold glitter paint I got in a Dusty Attic Mystery box last month. 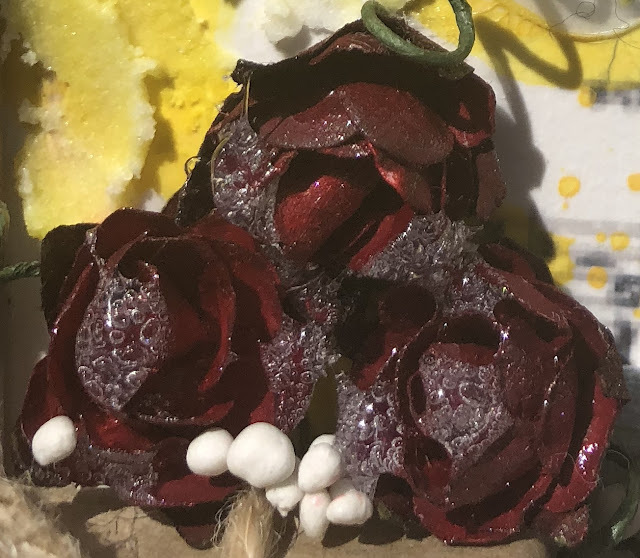 I dried this with my heat tool not thinking about the glitter in the pain and some of it melted so I knew when it came time to create my clusters I would have to strategically place things to hide the melted bits. 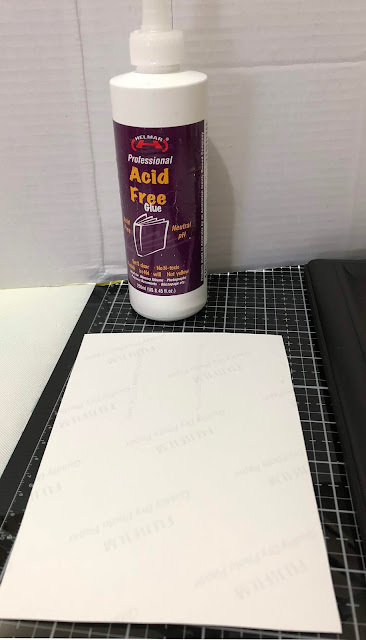 My background paper was created by cleaning up the left over purple paint by using the packaging technique (add water to the paint, smoosh a piece of plastic packaging in it and smoosh it onto white cardstock, I then smooshed/wiped the edges of the cardstock in the watered down paint that was left behind. Once I had my background cardstock dry I started building my paper layers and adding my photo. I used Helmar Acid Free Glue to adhere my papers, photo, chipboard and 2 of the washi pieces as it was the end or the roll and the washi was on a cardboard roll so needed some help to stick after I pulled it off. I love this glue so much. Now it was time to add my flowers and metal bits to my layout. 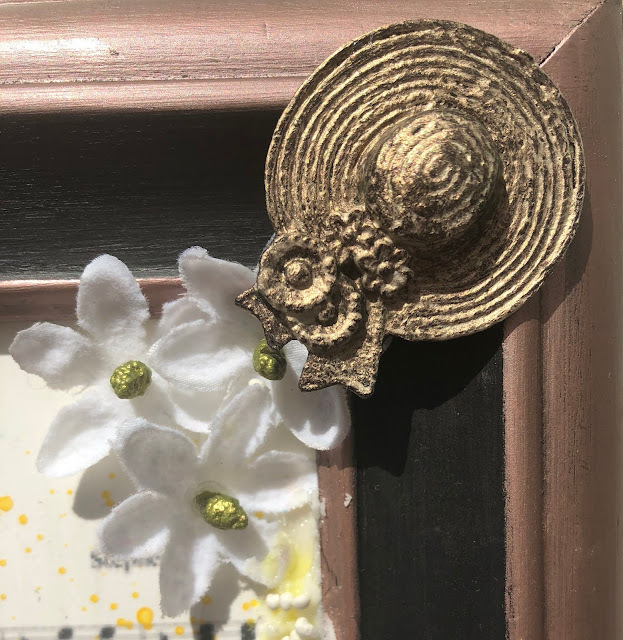 I started by building the cluster on and around my chipboard and then balanced it out with some washi in each corner and adding 2 flowers and some metal bits to these areas. I used Helmar 450 Quick Dry Adhesive to adhere my flowers, metal charms and metal flowers. This is my favourite glue for adding the chunky bits to my layouts. Once it was all down I added my title and a small amount of journalling. This photo tells a story that needs a lot of journalling so I am going to get my daughter to write it down and add a second page to it that is just journalling. Thank you for checking out my layout and I hope it has inspired you to create. Hi crafty friends!! Jeanne here excited to share my 1st project for the month of November!! We are given some choices of themes to chose from at the beginning of our term on what we want to make for our projects. Then our lovely Design Team coordinator Jessica assigns them to us on our monthly calendars. So this month for my 1st project I was assigned a "Pencil" theme. I couldn't decide on what I wanted to make, one would think a theme like this is super easy, but for some strange reason this was a little tough for me , I don't know why!! Then it popped into my head that hey I used to love pencil boxes and stationary sets when I was young. I have a few empty cigar boxes I had gotten a long time ago. I thought this one was a great size. So here it is........my Unicorn Mini Stationary/Pencil Box!!!! This project did not take very much time to do. It's nice to be able to change something up from something simple to super cute and bright. I began altering the box by applying gesso to the edges of the box, I had previously removed some of the paper that was on it using an X acto knife. I then began measuring all sides of the box, inside and out. I had purchased the small trio of small notebooks at Walmart. They were perfect size and of course matched great to the paper I used that I had in my paper stash. I purchased this 12X12 paper pad at Michaels. If it looks familiar I had also used this when I made some Rolodex cards earlier in the year. I decided I would use the adhesive from Helmar Premium Craft Glue because I wanted to show how I was able to use the same adhesive for a variety of items from the paper, to lace, flat back pearl embellishments, and much more. So once I cut all the papers for each area of the box, I adhered them , I adhered a very thin white lace along the front of the lid and two sides of the box. Just to add a little character. I mean who can't use a little lace even on a pencil box! I then made a small pocket for the lid and cut up some of the tag cutouts from the paper pad. I also cut out a thin piece of heavy card stock and then covered it with matching paper from the pocket to separate the pencils from the paper pads, and added a small stamp, some washi tape and big paper clip just for added decor. I picked out some matching flowers and adhered them on a small upper left corner as well as to the small pocket on the lid. I fussy cut out a cloud with an adorable sentiment from one of the tags I had cut to put in the small pocket. Lastly added an ivory half back pearl to the lid as a somewhat knob. I don't know why I love this song so much maybe because it brings the family back together, I'm not sure. I also have little tributes to My Favourite Things and Do-Re-Me on there as well. I couldn't leave them off as they are some of the popular songs from the movie and when you hear them it makes you think of the movie. 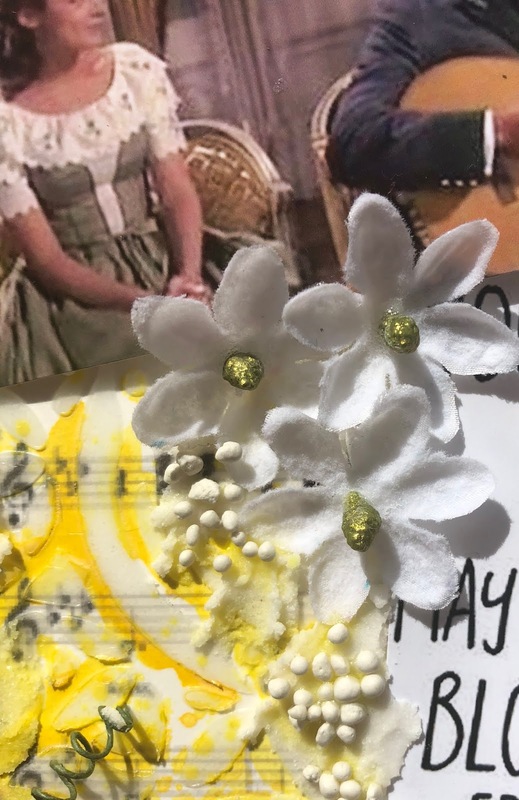 On the little flowers I used white flocking powder because the Edelweiss flowers look like they are fluffy so I use the Craft & Hobby PVA Glue to adhere the flock to the flowers. On the little stamens I used Colour Blast Colour Mica Powder in Olive dipping them in the Tacky Craft Glue first then dipped them in the Mica Powder. Once they were dry I used the 450 Quick Dry Adhesive to glue them to the flowers. 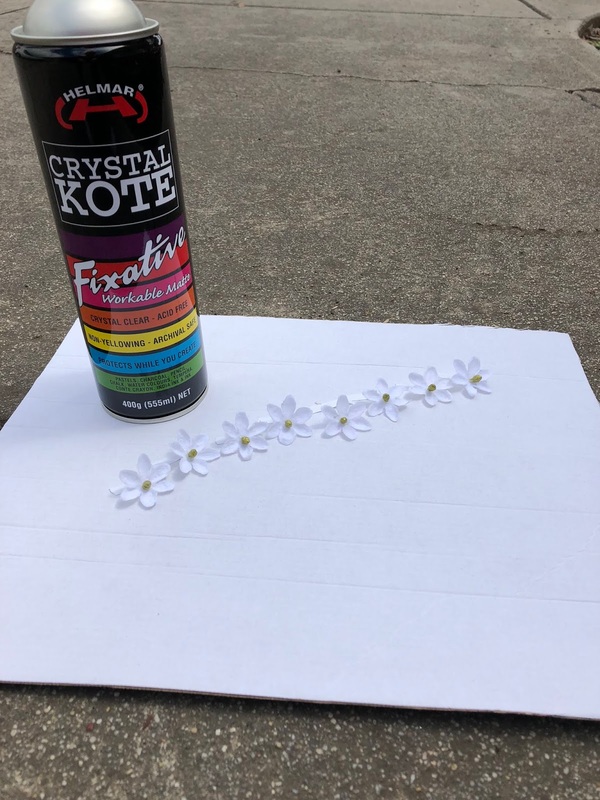 After the glues were dry on the flowers and stamens I then took them outside and sprayed them with the Crystal Kote Fixative Spray because of the Mica powder and the flocking powder I wanted to make sure they didn't come off. 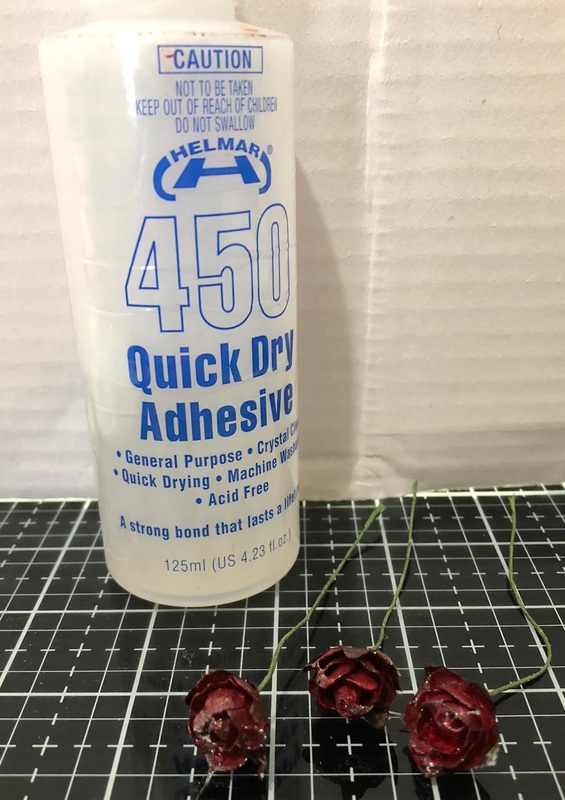 I also used the 450 Quick Dry Adhesive to the flowers to make it look like rain drops on roses. Like always I used the Acid Free Glue on my photos. I found some of the word from the song off the internet so I printed it off on photo paper. I had a metal hat I couldn't find a straw colour like Maria's hat so I used Vintage Silk Finnabair Wax. In the background you can see sheet music which is the music from the song Edelweiss. Then for some colour I used Mustard Seed Distress Oxide ink. Here's a close up of the Raindrops On Roses unfortunately you can see the bubbles from the glue but I still like that it looks like they are wet. Here you can see some of My Favourite Things - Bright Copper Kettle (I used Rich Copper Cinnabar Wax), Brown Paper Package, Raindrops on Roses. On the frame I randomly used Icy Snow Paste and Finnabair's Art Stones which were stuck down with Tacky Craft Glue everything else was stuck down with 450 Quick Dry Adhesive. On the edge of the frame I used Rose Gold Finnabair Wax. On this Memory Maze Criss Cross Mini Heart I used Fire Ruby Finnabair Wax it has such a beautiful shimmer to it. On the little bow I used Colour Blast Colour Artist Ink Calypso . I decided earlier this year to create more fun in our lives. At first I thought about doing themed days for their educational, cultural and awareness raising value, I also realised making the decorations and food could be great for fine motor skill and sensory activities for myself and the boys. With this in mind I have been trying to think of themed things we could do and Dr Who is just perfect for this need, and we could get 3 days out of it. Dr Who Day could be the season premiere, the anniversary aka my Granddaughter's birthday and Boxing Day (our favourite Dr Who Day each year). So I picked out a few ideas that would be things myself or the boys could do and one thing I have wanted for a long time is a Weeping Angel decoration so I decided to make a Weeping Angel decoration that could either stand on the table or be a tree topper. I found a few tutorials online for converting a barbie into a Weeping Angel and I asked my friend that lives in the town that has my closest Kmart to pick up one of their $4 barbies for me when he was next in Kmart, as I couldn't get to the op-shop at the time. About a hour later he sent me pics so I could choose one. All the tutorials either melted the elbows and wrists or used hot glue, I didn't want to melt plastic as this releases toxic chemicals into the environment and I prefer using Helmar glues over hot glue as I tend to get glue all over me when I craft and Helmar doesn't burn. So I planned out what glues I would try for which part and set to work once my friend dropped off my $4 knock off barbie. Marker for drawing your wing outline. I decided to try using the doll's hair to create the Angel's hair instead of the method used in all the tutorials and absolutely love the finished look, it was certainly much easier than the other method. I simply put her hair into a ponytail at the right spot on her head (her original style was too high), then I wound the hair around into a bun shape and gluing with fabric glue as I went. I finished it off by trimming the hair and using fabric glue to kind of seal the shape where it was trimmed. I thought that once it was painted you wouldn't be able to tell. I finished it off by adding a skinny ribbon around her head with Helmar Fabric Glue. Now for the arms I simply cut them at the elbow with a stanley knife and glued them at a right angle using Quick Dry 450, as the edges don't meet very well I let it have a long drying time and then used some polymer clay to fill in gaps and sort of stabilise the joint. I didn't need to do anything to the wrists as the plastic is a soft plastic so her wrists and fingers were bendy and a small amount of glue where the fingers need to attach was all that was needed. For the dress I started by making a cardstock cone, I simply wrapped some cardstock around at her waist into a cone shape, glued it at the seam with Helmar 450 Quick Dry Adhesive as that is what was on my desk and open. And then trimmed the base of the cardstock level with her feet. I then cut some white tulle and cut head and arm slits in it. Put this over her and tied some ribbon around her waist. I added in sections of tulle to cover her cardstock base. I eventually realised that because I had bought Pewter Paint not Stone or Granite the tulle would show as tulle so after putting her wings on I added some gauze by selectively gluing pieces over her and then tieing another skinny ribbon around her waist. For the wings I used some 1mm (2mm or 3mm would also work) white craft foam. I cut a rough angel win shape and drew in the feathers on both sides with a embossing stylus. I also cut 2 small bits for the tops of the wings. I glued these onto the base with Helmar Foam Glue, and let dry. I attached the wings to the doll with Helmar 450 Quick Dry Adhesive. I took her outside and spray painted her with the Pewter Paint, taking her upstairs to dry on the railing of my back landing. The Gauze definitely was the better choice of fabric. I like how the polymer clay gave her a more hand carved statue feel. I love how she turned out and since I used Helmar I know she will last. I have an 18 month old granddaughter who lives far away from Michigan in Phoenix. We maintain contact through daily facetiming and visits as often as we can, but I am always trying to think of ways to strengthen our bond. Lauren recently got a playhouse which has a mail slot. I thought of the perfect way to stay in touch by mailing her Alphabet Postcards. I made the cards from Watercolor paper cut to a 4 x 6 size. I kept them simple by writing the Capital and small letters and adding a picture associated with that letter. I wanted to make sure these would make it through the post office and be protected in case they got wet. I seal each card with a coat of Crystal Kote Gloss Varnish. This spray which dries clear will protect them from dirt and moisture. Lauren enjoys receiving this mail from Grandma! It is important to seal your projects and I highly recommend Helmar Crystal Kote Varnish! Please be sure to visit Helmar on Facebook for more inspiration. Click on the button at the top to order your Helmar supplies! Thank you for visiting today and I look forward to sharing an other project with you next time. Which wedding card do I choose? Hi its Bridget here again. This month is a very exciting month for my family. My brother in law is getting married! So this month I decided to go out of my comfort zone and make a wedding card for them. I very rarely make cards, I am not sure why that is but I think I need to start making more. I could not quite decide what style I wanted to do, so I did two. Here they are. First fold Doily in half slightly off center. Fold again, also slightly off center. Fold tip back. Folding the Doily off center gives the skirt a layered look. I ripped one of my pieces of patterned paper down on edge before adhering using Helmar's Craft Glue, to give a bit of texture to the card. Again using Helmars craft glue, adhere the doily. I also added a little ribbon and using the inside part of another doily I added the top part of the dress. To finish off the card I added some pearls. For my next card, I started of using colourblast paste in Bling. I roughly scraped it on. Then using a heat gun I dried it. It ends up such a bright shimmery gold. Using Helmars Craft glue, adhere a Doily to the side of the card. Add a ribbon, using Helmar's Craft Glue. So the card is not so flat, I used Helmars fabric glue to bunch up the lace before I adhered it to the card. Lastly I added a Charms Creations heart and some D-lish paper flowers using Helmars craft glue. So which card would you choose? Thank you for joining me today. Happy crafting! How to paint with glitter to make a glittery layered elephant that sparkles! Hi all of you Helmar fans, it's Kristina again with my first project for November. 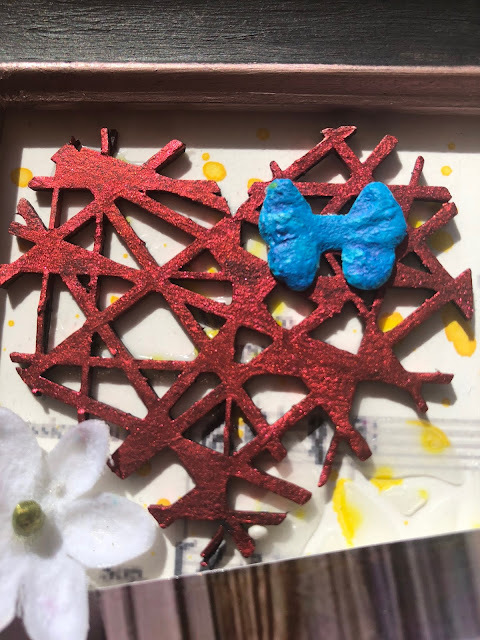 I am really excited to show you how to create this awesome shaded glitter elephant on wood canvas using Helmar products. I absolutely loved doing this project because it has a similar concept as painting, and I really love painting!! Here is a picture of the finished piece, with background glitter, and without. To begin with I got a picture from the free photo sharing website Pixabay, these are able to be used freely with no copyright issues. This is the picture I chose. I wanted only grey tones in the picture so this one was perfect. I got my wooden canvas and covered it in two layers of white gesso, and when it was completely dry I traced the parts of the elephant that I wanted onto my canvas. This next part sounds tricky but I promise it isn't. I got seven plastic cups and I put approximately 3cm high of white glitter in six of the cups, leaving the last one for the pure black glitter. The first cup you just leave pure white, the second cup has a tiny bit of black pearl ex added to make it slightly darker than the white, the next cup has a little more black pearl ex added to make it a little darker than the previous one and so on until the sixth cup is filled with white glitter that is almost black. Basically making the different grey tones that the elephant requires. Now for the messy bit, I poured Helmar Tacky Craft Glue over the whole of the elephant (in sections so the glue didn't dry before I got to the last part), and I put a base coat of glitter along the whole elephant. I chose the fourth cup of glitter as my base coat (that would be the third cup after the white glitter). The next part is the layering, which adds the POP to the elephant. So we will say that the plain white glitter is 1, the next darkest glitter 2, and so on until we get to the plain black glitter. With that in mind I have drawn a basic diagram indicating the places to put the different colour glitters. You can do as much or as little as you please, or even take it further and do more layers! If you follow these colours and approximate spots for them you will have an amazing glittery beautiful elephant that will be the envy of all your family and friends. I used a popsicle stick to carefully drop the tiny bits of glitter in the smaller spots. It made it easier than using my fingers, which tend to make a mess. Using a paint brush that I didn't mind having glue on it, I brushed the Helmar glue only on the spots I wanted the glitter to be. After all the glitter is done, and you are completely happy, it is time for the eye placement. I chose some red beads so they would stand out in between the greys of the elephant. I used Helmar Gemstone Glue to ensure that the bead eyes stuck perfectly well to the elephant. This is the time that you decide whether or not you want a background glitter colour. I decided on turquoise. Cover all the spots you want to put the background glitter with Helmar Tacky Craft Glue, and then sprinkle away with your chosen colour. Once all was completely dry I got out the Helmar Crystal Kote Gloss Varnish spray to seal everything in, and to make sure the glitter was not going to escape all over my house lol. I love the Gloss Varnish spray, it is the perfect finish for any project.